"Kway teow" redirects here. For the Malaysian/Singaporean noodle dish, see Char kway teow. Not to be confused with Kuy teav. Shahe fen or he fen is a type of wide Chinese noodle made from rice. While shahe fen and he fen are transliterations based on Mandarin, there are numerous other transliterations based on Cantonese, which include ho fen, hofen, ho-fen, ho fun, ho-fun, hofoen (a Dutch transliteration in Suriname), hor fun, hor fen, sar hor fun, etc. 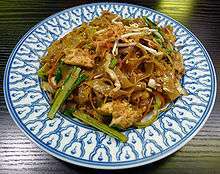 In addition, shahe fen is often synonymously called kway teow (粿條), literally "ricecake strips", transliteration based on Min Nan Chinese, POJ: kóe-tiâu) or guotiao (pinyin: guǒtiáo; the corresponding transliteration of Mandarin), as in the name of a dish called char kway teow. However, shahe fen and kway teow are strictly and technically not the same (the latter being essentially ricecakes sliced into strips) and the Min Nans in general still consciously make a distinction between shahe fen and kway teow in their speech. Original ricecakes or its strips are very stiff in texture (even after cooking), making them unpopular with modern consumers. It is also known in Sabah as da fen (大粉), means "wide vermicelli", due to its similarity of colour and texture to rice vermicelli. These noodles are called guay tiew sen yai (Thai: เส้นใหญ่, meaning "large rice noodles") in Thailand, and kwetiau in Indonesia. Shahe fen is believed to have originated in the town of Shahe (Chinese: 沙河; pinyin: Shāhé; Jyutping: Sa1ho4*2), now part of the Tianhe District in the city of Guangzhou, in the southern Chinese province of Guangdong, whence their name derives. Shahe fen is typical of southern Chinese cuisine, although similar noodles are also prepared and enjoyed in nearby Southeast Asian nations such as Vietnam, Thailand, Cambodia, Philippines, Malaysia, Indonesia and Singapore, all of which have sizeable Chinese populations. 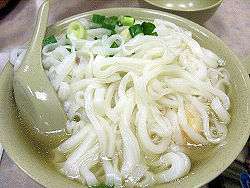 Shahe fen noodles are white in color, broad, and somewhat slippery. Their texture is elastic and a bit chewy. They do not freeze or dry well and are thus generally (where available) purchased fresh, in strips or sheets that may be cut to the desired width. Where fresh noodles are not available, they may also be purchased packaged in dried form, in various widths. Shahe fen noodles are very similar to Vietnamese bánh phở noodles, which are likely derived from their Chinese counterpart. Although the phở noodles used in soups may vary in width, wide phở noodles are also common in stir fried dishes. The popular Thai dishes phat si-io and drunken noodles are also made with similar noodles. 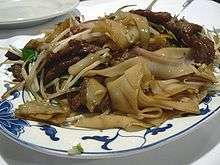 Shahe fen is often stir fried with meat and vegetables in a dish called chao fen (炒粉; pinyin: chǎo fěn). While chao fen is a transliteration of Mandarin, chow fun from Cantonese is the name to which this dish is most often referred in Chinese restaurants in North America.